Although potholes are an unsightly annoyance, their impact can be more than aesthetic. People who stumble into them can injure themselves, and cars driving over them can suffer damage to their alignment, suspension or wheels. This could leave you on the wrong end of a lawsuit, and at the very least, your reputation could suffer. An aggressive stance against potholes involves fixing any that develop and being proactive about preventing them. Like many other issues, fixing potholes while they are small can save you money. Smaller potholes can often be repaired through filling or patching if the surrounding pavement and the foundation are in good condition. Larger potholes may require removing a bit of the surrounding pavement before replacing it with new asphalt. However, if the pothole has been neglected too long, large cracks may be radiating from it or alligator cracking may have occurred. The foundation may have been compromised by water penetration. These problems may require a full-depth removal of a large area of pavement and foundation repair prior to replacing the pavement. Potholes are almost always the result of water that has seeped beneath the pavement. 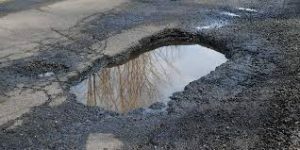 Water causes weak spots that can allow the pavement to droop, and as traffic passes over the weakened area, potholes can form. The normal freeze/thaw cycle will make the problem worse. Preventing water penetration is important, so you should have cracks filled as soon as they develop. One maintenance procedure that is often overlooked is the removal of automotive fluids. These fluids are petroleum-based chemicals that will soften asphalt pavement. Traffic can destroy these softened areas, leaving a pothole. Even if a pothole does not immediately develop, the weakened area makes the area more susceptible to water penetration. Automotive fluids and other chemicals should be thoroughly cleaned on a regular schedule to prevent damage to the pavement. Making regular sealcoating a part of your preventive maintenance can also help protect the health of your pavement. Sealcoating will not prevent automotive fluids from penetrating to the pavement, but it will slow their progress. Sealants also increase the waterproofing qualities of asphalt pavement to help prevent water infiltration. Asphalt Pavement Solutions has over three decades of industry experience. We provide customers throughout Delaware, Pennsylvania and New Jersey with an extensive range of asphalt-related services. Our services include asphalt paving, infrared patching, crack sealing, asphalt repair, parking lot striping, sealcoating, inlet repair and the installation of bollards, traffic signs and car stops. We are committed to delivering quality work at competitive rates. If you would like to request a free quote, you can complete the online form or call us at 1-800-559-SEAL or 1-856-461-1710.